Kenneth Jan Kwiatkowski comes from a family of Funeral Directors living in Jersey City, NJ. Czeslow Kwiatkowski emigrated to Jersey City from Poland in the late 1800s along with his four brothers. He became an Undertaker at 445 Monmouth Street (now called Plaza Funeral Home) serving the parish of St Anthony of Padua RC Church, the first Polish parish in New Jersey. Czeslaw's brother was Father Bolislaw Kwiatkowski, a longtime Pastor of St Anthony's in that era. Ken's grandfather, Franciszek Kwiatkowski, took over the family business from his father in the early 20th Century, serving the growing Polish population who migrated to Downtown Jersey City to work in her abundant factories and industry. In 1944, Franciszek (or Frank, as he was known) opened the Kwiatkowski Brothers Garrison Avenue Funeral Home (now called Evergreen Funeral Home) in the growing Uptown section of the city to serve the parish of St Ann's Polish RC Church, which completed its new church in 1946 (the parish was started in 1911). 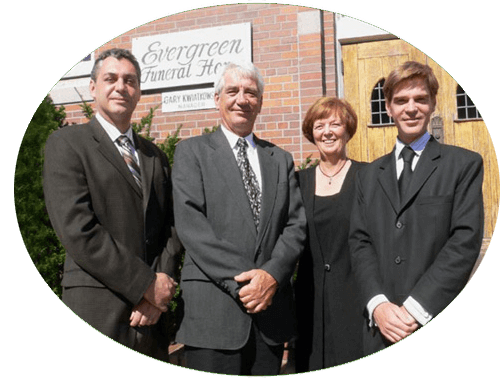 Frank and his brother Stanley owned and operated the two funeral homes together for many decades. Ken's father, Gary Jan Kwiatkowski, took over the operation of both funeral homes in the 1970s and 80s. He, along with his wonderful wife, Suzanne Kwiatkowski (nee Koebert) from Philadelphia, have operated the two funeral homes together from that time until very recently. In 2001, Ken Kwiatkowski was licensed by the State of New Jersey as a funeral director as has been working in that capacity at the two locations ever since. In 2012 Ken married his beautiful wife, Anna Ulazka of Jersey City. In 2013 they were blessed by the birth of their son, Roman. Ken and his family currently live in the Journal Square neighborhood of Jersey City and are very pleased by the recent growth in their home city. Ken is honored to serve not only the Polish community of Jersey City, but also all of her ethnically diverse residents.